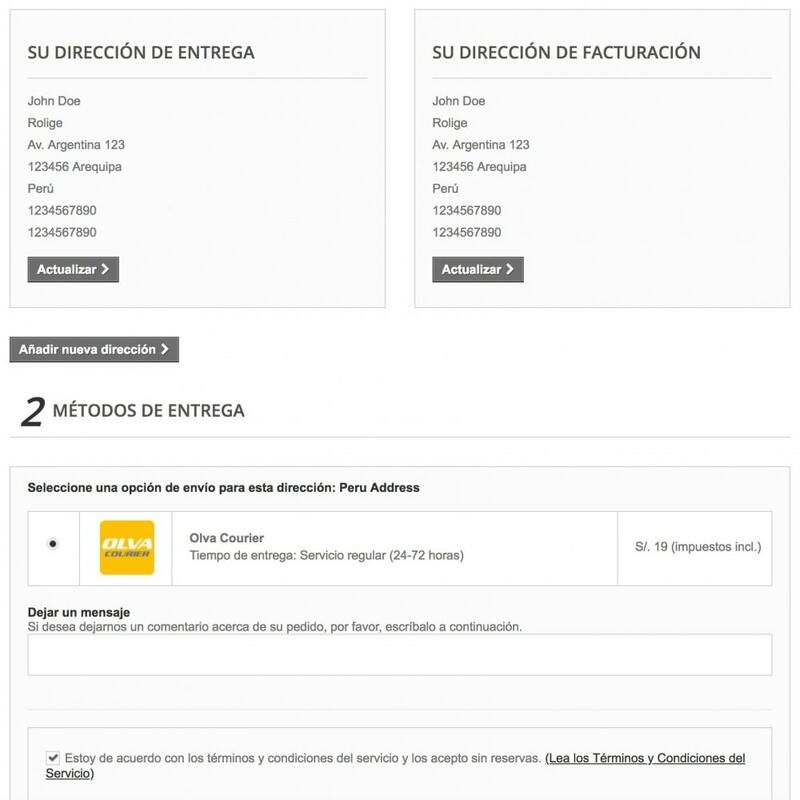 Calculates in real-time the shipping costs through the Olva Courier online quoting service, based on Lima (as origin) and the client's destination city, dimensions and weight of products added to the shopping cart. Trusted shipping costs obtained directly from the Olva Courier online quoting service. All cities addresses registered by the customer and belonging to the country of Peru, will have a normalized format. 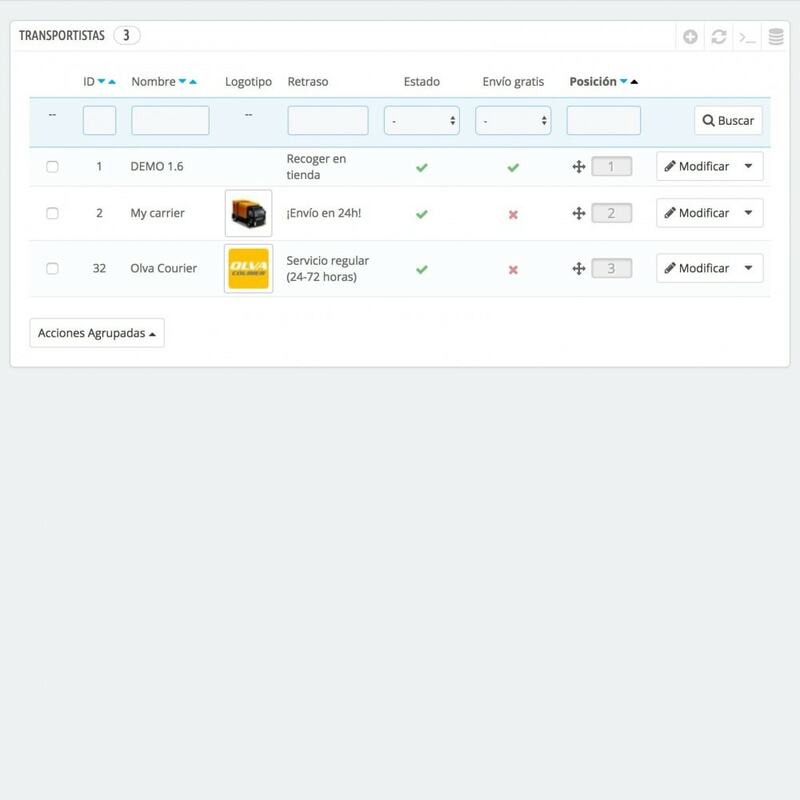 In case your products do not have dimensions or weight, the module allows you to set dimensions and weight of customized products to calculate the shipping costs. 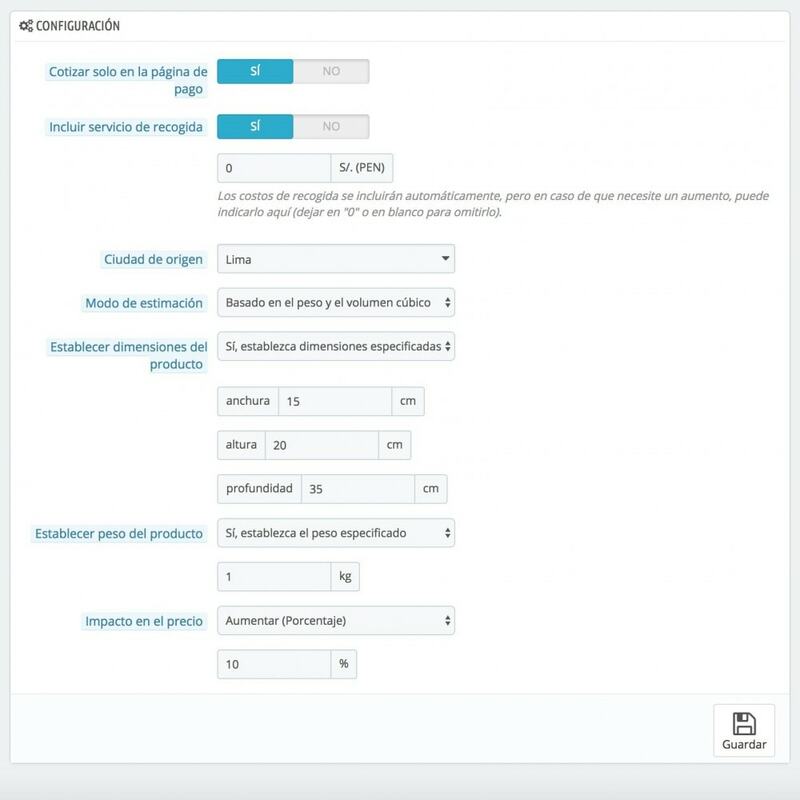 Option to add an impact or adjustment to the shipping costs displayed by the carrier before showing it to the customer. Simple configuration focused on obtaining accurate and adjusted shipping costs for your business model. No contract with the supplier is required at this time to make use of this module. No override files are required for proper functionality of the module. Calculates shipping costs in real time through the Olva Courier online quote service. Use of cache in the results to improve the loading speed of the site and to make calculation of the costs only when there is a change in the shopping cart. Normalizes the cities of all customers belonging to the country of Peru. 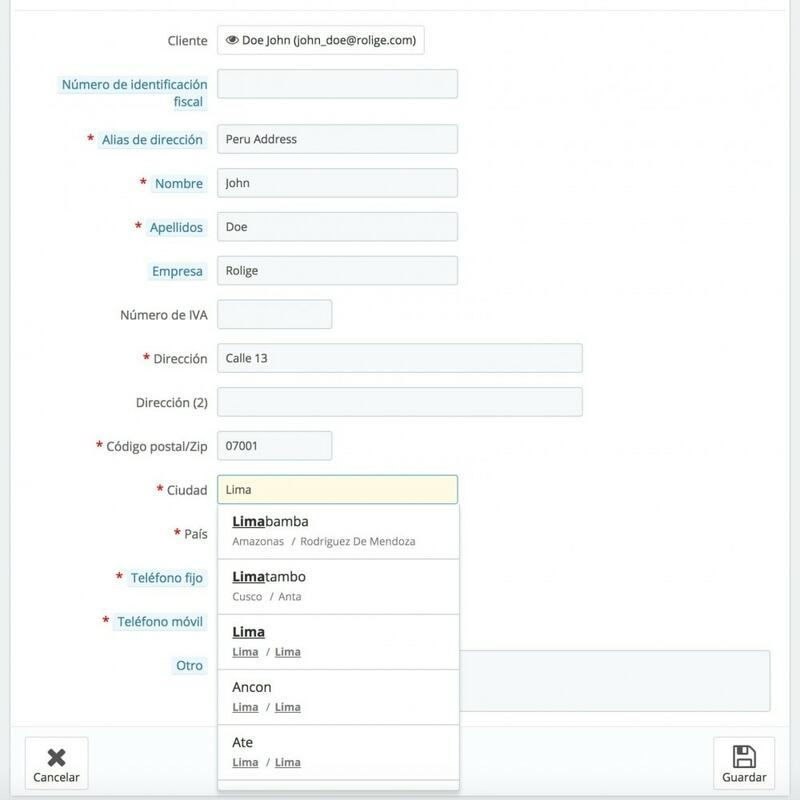 In the address form, the entry of a City uses an autocomplete with all the cities of Peru to avoid any incorrect entries, since the cost of shipping is 100% based on them. Compatible with orders generated directly from the Back Office. Option to perform shipping cost calculations only on the order confirmation page to improve site navigation performance. Option to include the pickup cost in the shipping cost. 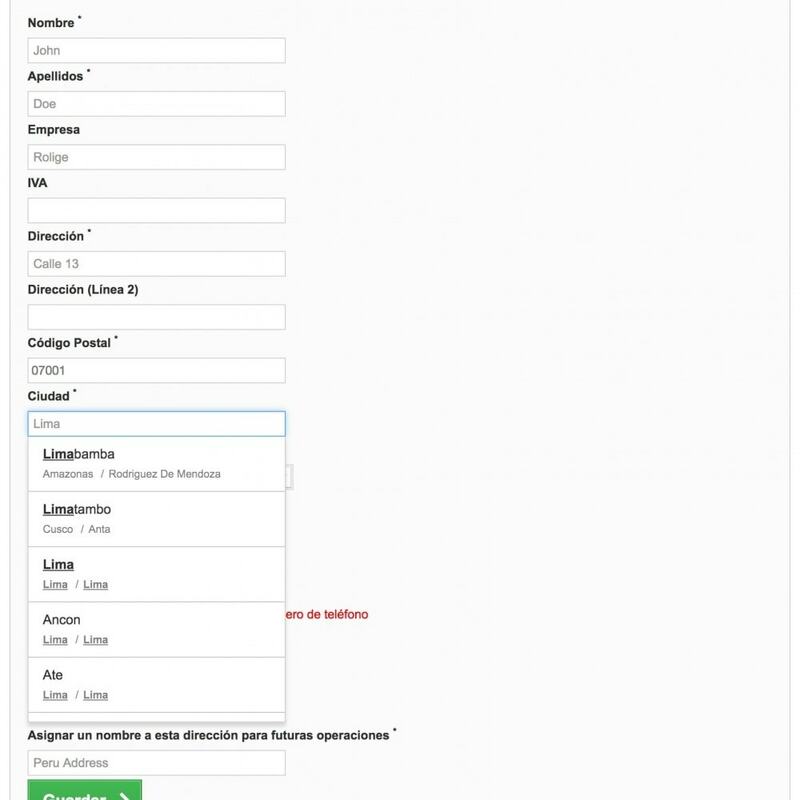 Option to specify the city of origin for shipments. 1). Based on weight and cubic volume. 2). Based on weight and an optimized three-dimensional volume algorithm, which simulates the packaging of all products in a 3D box. Option to set custom dimensions for your products to be used when calculating shipping costs. Option to establish a custom weight for your products to be used when calculating shipping costs. 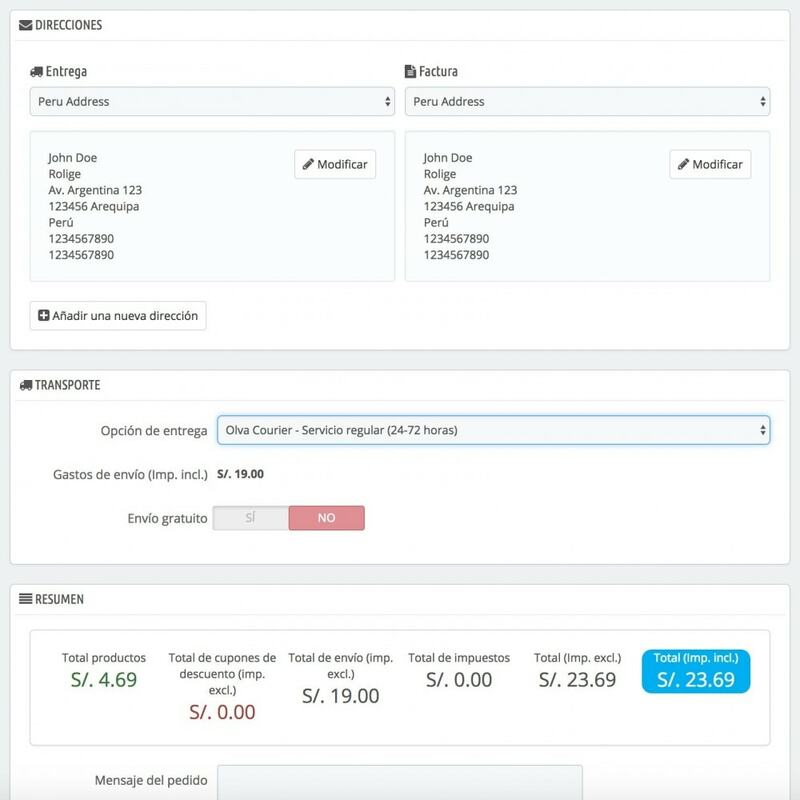 Option that allows you to establish an impact on the cost of shipping before showing it to the customer. Q). Do I need credentials provided by Olva Courier to use this module? A). No, as of right now Olva Courier does not require credentials to make use of the online quoting service. Q). Can I make shipping cost quotation with other origin city than "Lima"? A). 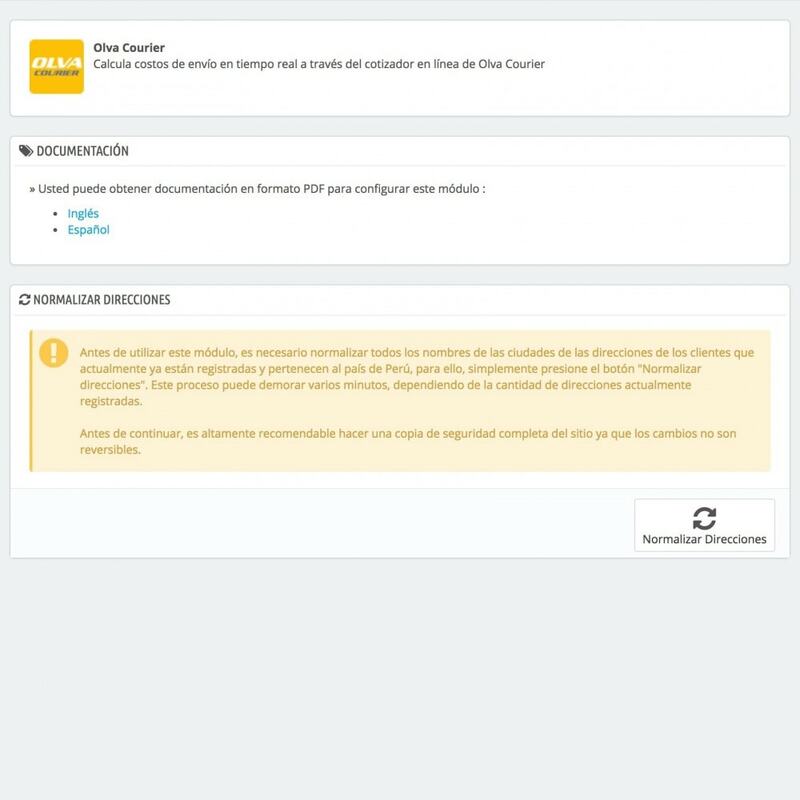 No, at the moment the origin of the quotes are limited only to "Lima" due to restrictions of the Olva Courier online quoting service. Q). It is necessary to load departments, provinces or districts for it to work? A). No, the module already includes more than 1800 districts of Peru. Q). Does it work with other currencies? A). Yes, but your store MUST have the Peruvian Sol (PEN) as a currency installed. Q). Are all prices updated? R). 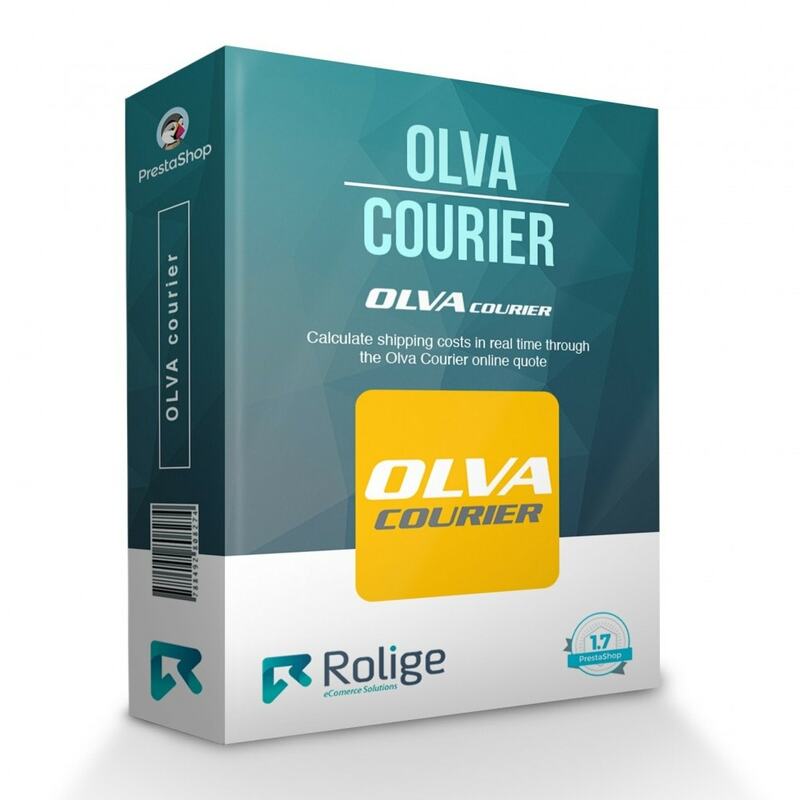 Yes, all prices and costs are obtained directly from Olva Courier's online quoting service in real time. Q). Is the module compatible with the Serpost module? A). Yes, it's completely compatible. Know the cost of shipping in real time based on the products of the shopping cart and the delivery address, this generates greater confidence to the customer and helps to close the sale. Reduces communication time with store manager. It is mandatory that your products have specified dimensions and weight in the Shipping tab within the product editor, or that you use the module options to consider these custom values at the time of calculation. The quote system only works for addresses in Peru. 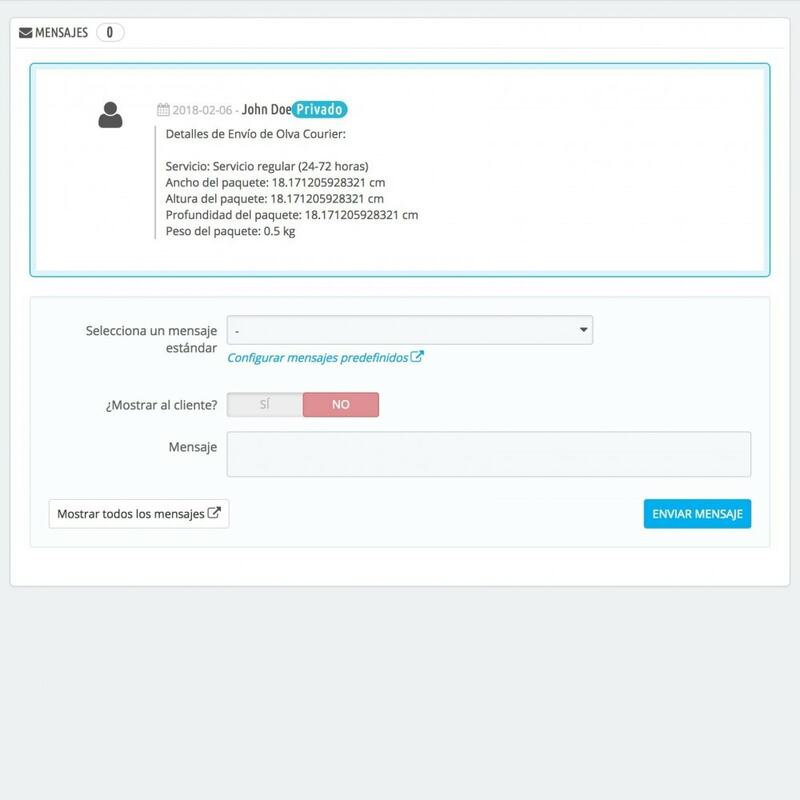 The installation is completely automated and intuitive, the first form aims to normalize all cities in the addresses of the customers that belong to the country of Peru, in order to obtain valid shipping costs. The module will try to normalize as many addresses as possible, if there are any that could not be done automatically, they must be modified manually.